The founder of 1064 Givers, Ema, learned the true nature of how a third world country's education system really works. While visiting her family every summer in Colombia, she dedicated her time to giving back to the community. She first volunteered at Institucion Educativa Enrique Olaya Herrera, a public school in Neiva, Colombia. There, she noticed the lack of infrastructure public schools faced due to the lack of funding in the education system. Through her work with this school, Ema was able to connect with the teachers and administrator. Her findings sparked the initiative to spread awareness and an inside view of the Colombian education system’s reality. From there, Ema took her ideas back to Loyola University Chicago and began mentioning them in her classes. As classmates discovered her ideas, they embraced them into class projects. Slowly, these class projects developed into what we know today as 1064 Givers. In 2016, Ema with the help of her classmate, Collete, began a fundraiser through Foxcause for research on Colombian schools’ education. They were able to raise $1,500.00, which they used to visit Colombia for further research. While on their research trip, they were able to connect with Jorge, an anthropologist from Colombia. 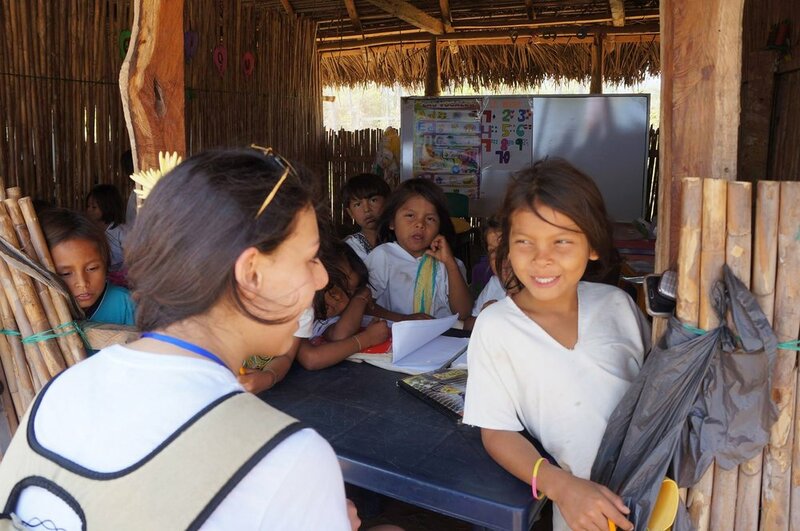 Through Jorge, Ema and Collete were able to visit Santa Marta, Colombia, to meet two Indigenous Tribes from the coastal region of the country: the Arhuaco and Wayuu tribe. During their time exploring these different regions of Colombia and learning about the different cultures, they were able to define two important issues the schools were facing: contaminated water and lack of infrastructure. Learning about the issues of the Colombian education system, Ema knew she had to help make a change. She founded 1064 Givers, a non-for-profit aimed at raising money to help empower students and grow into an organization where they could invest in the infrastructure of these schools and help them develop into a safe, stable and sustainable environment for the students they host. With the support of friends and Loyola faculty, 1064 Givers was created. 1064 Givers is a legal Non for Profit with a 501C3. Since the beginning, 1064 Givers’ main goal is to raise awareness of the mission and slowly grow into an organization to be able to help execute projects in the communities visited. The top priority of 1064 Givers is to go into a community, where they are given an opportunity to help. Many communities in Colombia have closed off outside help, as past organizations have gone in and promised things that never were implemented, thus creating a lack of trust in foreign help. These communities want COLLABORATION to create a sustainable partnership for years to come, not just donations of money, which is what makes our organization different. Although we are small, we are determined to enforce all of our plans within the communities. We have created a bond with our communities, and we hope to eventually expand into others to ultimately empower as many students as we can.